The City of Edmonton has developed a recommended long-range concept plan for 75 Street between Wagner Road and Argyll Road. 75 Street is part of Edmonton’s inner ring road and is intended to facilitate cross-town movements on a high capacity roadway within the city limits. The purpose of this study was to determine roadway improvements that will allow for smoother and safer traffic flow along 75 Street, ensuring the efficient movement of goods and services across Edmonton. 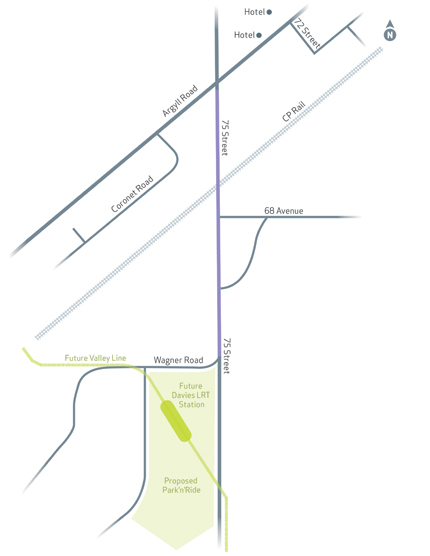 The planning project from Wagner Road to Argyll Road will look at widening the road from a 4-lane to a 6-lane urban roadway with access management and intersection improvements, and a possible grade separation (underpass or overpass) on the CP Rail line. The 75 Street corridor south of Wagner Road is part of the proposed Valley Line (Southeast) LRT corridor and is designed to accommodate 6 lanes of traffic. The two sections of roadway are envisioned to mesh seamlessly. The plan also anticipates changes to traffic patterns around the proposed Valley Line LRT Station, Transit Centre and Park ‘n Ride facility at the corner of 75 Street and Wagner Road. A number of design options were looked at in order to develop a concept plan that would meet the functional requirement for all modes of transportation and minimizes impacts to the adjacent property owners. The 75 Street Planning Study is in the concept stage of the project lifecycle. Interviews with impacted stakeholders along 75 Street were conducted in early 2014. Project updates were posted on the website and roadside signs informed the public of updates. This recommended concept plan balances the concerns of stakeholders, the technical requirements of the project, and the City's policies. There is currently no budget allocated to this project and therefore no timeline for construction. 75 Street recommended concept plan is now available for review.